This system is intended for patiently gamers with moderate capital. It is special in that, that bets on the number, or least likely variable, but it is a very economise system, which are able keep players in the game for a very long time. 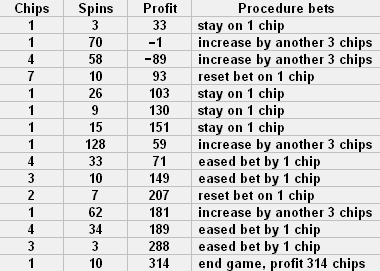 On the left is marked with the number of chips bet, right then the number of spins, after which they were bets chips unchanged, than occurred win. Further to the right account balance after win a and the rightmost the description of the action, which follows after winning, by 4 situation. The system can be applied to multiple numbers simultaneously and yet so increase its balance.